Fall is in full swing, the leaves are changing colours and the cool weather has arrived! We have had several rainy days which called for an indoor recess at my daughter’s school. She loves to tuck the “Polly Pocket Say Freeze Pocket World” into her backpack to play with during these rainy indoor days. The “Polly Pocket Say Freeze Pocket World” is a tiny playset that lets you take the party fun without no matter where you go! 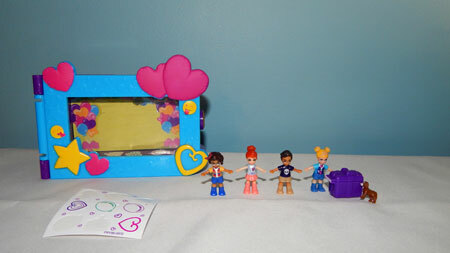 Included in the playset are 4 microfigures, smart stick stickers, purple case, a tiny dog and picture frame. The micofigures are incredibly tiny and the dog even tinier! My daughter loves the small size of these toys. The dog fits into the little purple case. The dolls will stick on the “smart stick stickers” that you can place on any flat surface of your frame. If the doll stops sticking, just clean her with a little soapy water. They are super cute wearing trendy clothes. 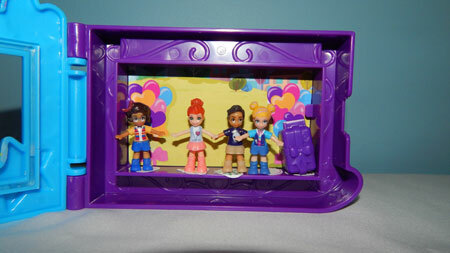 The dolls fit inside the frame for transport and storage. The background image can be swapped out for your favourite picture. Be sure to print it out on cardstock or other heavy paper, this acts as the back wall of the frame. If the paper is too flimsy, your dolls will fall out. I wish this had a plastic backing, so the dolls didn’t fall out so easily. If it had a stronger back, it would be ideal. I love that the background image can be swapped out. Only one background comes with the set. My daughter likes to draw and colour various scenes for the dolls to play out. Nothing is off limits! From a snow covered mountainscape to a sunny tropical beach, she can create any background to set the scene for her dolls to play. 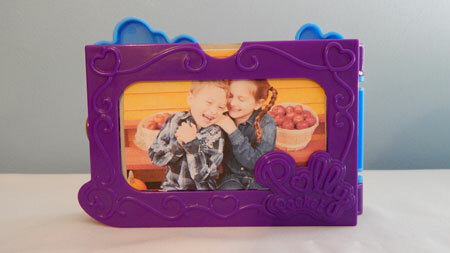 When not in use, the frame can be displayed on a shelf with your photo. 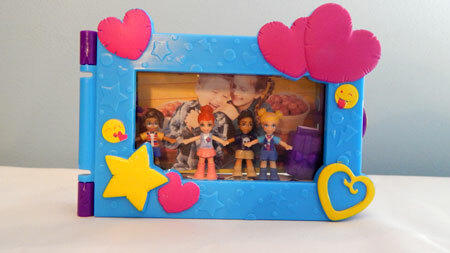 The front of the frame has a piece of clear plastic covering the opening, while the back left open. The colours of the frame are bright and cheery. After a day of play, one of the “Smart Stick Stickers” is already beginning to peel off. It wasn’t placed perfectly on the flat surface so, the top of the sticker is peeling away from the bottom part. 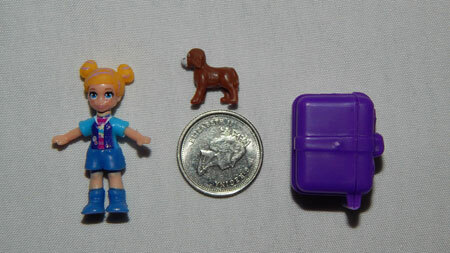 This set is a great addition to the “Polly Pocket Go Tiny! Room Playset”. It is a good set to take when travelling because of the interchangeable background. *Disclosure: I received a complimentary “Polly Pocket Say Freeze Pocket World” playset through the Amazon Vine Program. All opinions are 100% my own.